6 small artichokes – the frozen artichoke hearts (available at ethnic supermarkets) are also an alternative. Have ready a bowl of fresh water and add the juice of one of the lemons and a desert spoonful of salt. First of all prepare the artichokes. Remove several of the outer leaves, until the pale inner ones can be seen. Slice off the tip of the bud. 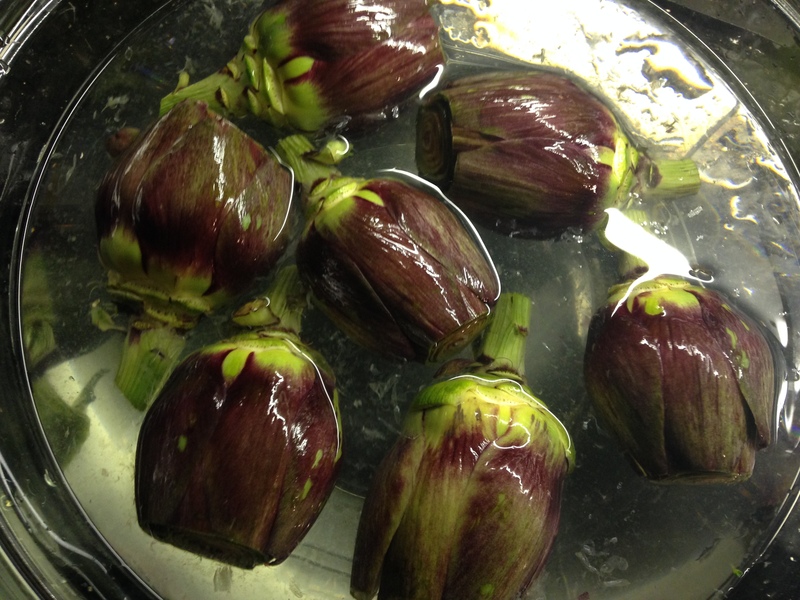 As you prepare each of the artichokes, place them in the bowl of lemon/salt water. This stops them turning brown. Now chop the onion and peel the carrots, potatoes and shallots. Cut the carrots into thick slices and halve the potatoes. Blanch the shallots in boiling water for 5 minutes, drain and set aside. Drain the artichokes and squeeze slightly to remove any of the soaking liquid. In a large casserole heat 2 – 3 table spoonfuls of olive oil , put in the chopped onion and soften until translucent but not too brown. Now add the shallots, turning them in the oil for a few minutes. Add the carrots, potatoes and artichokes, again turning them in the warm oil for a few minutes. Add the warm water, juice of half a lemon, 2 tablespoonfuls of chopped dill, the remaining olive oil, salt and pepper.